Relocation of data center, consolidation of storage or server, replacement of server, storage upgrade, workload balancing or performance-related maintenance — there can be plenty of reasons why organizations undertake to migrate data. Data migration is a mandatory routine for IT operations in almost every organization. It helps to keep a business up-to-date with the latest technological advancements and keep in sync with industry standards. But let’s not confuse data tools migration with data integration. While in data migration, an already stored data is transferred to a new system or storage environment, data integration is a combination of business and technical processes that collect data from disparate sources for the sole purpose of analysis and conversion into valuable business insights. Data integration follows a common practice of extract, transform, and load. Data migration, on the other hand, transfers data in its raw form, from the source tools into a consolidated storage system such as the Data Lake. Although this kind of practice may generally seem to have reduced all kinds of complexities involved with data transfers, data migration has its own downsides. The process often turns out to be complex and discourages organizations from purchasing or deploying new technologies. Business operations are also affected and that is why vast majority of data migration tasks are scheduled during weekends or offline hours. This leaves a relatively negative influence on the IT staff morale, causing staff overtime and putting business operations at stake especially if it gets difficult to bring back the system online. Moreover, deployment delay of new storage facilities raises its effective cost, which the company has to amortize in addition to the cost of old hardware. Besides, old hardware require more hands-on maintenance, has lower performance and is prone to frequent failures. In that case, companies are always subjected to the troubles of data loss or increased cost. How can organizations minimize the business impacts of data migration? The only way you can simplify the process is by adhering to a set of practices. These include evaluating, analyzing, cleaning, and organizing before proceeding to combination and reconciliation. Complexities of data strings and current data classification systems can largely influence the direction in which an organization moves forward with the tools migration and the integration processes. Data evaluation involves analyzing what kind of resources the organization possesses, the type of storage where these data resources are stored, and how complex is the data that is stored. Though data is an integral part of a business process, the problem with it is that it becomes voluminous. As organizations continue using different modes of tools and technologies, the need to filter out valued information grows high. Establishing a comprehensive set of rules and standards will help you determine which data to migrate and which to not. It is also important to define the business rules that will define how you use data. These rules will ensure to maintain the compliance and compatibility with business and validation rules as well as with future policies and regulations. An information governance structure figures out who will be responsible for managing the information, data quality, access, and appointing someone who will have a final say on data usage throughout an organization. Since an entire organization is affected by data migration, it is important to be careful when deciding upon an information governance structure. Data quality assessment eradicates duplicate contents that are irrelevant to current and future business processes. The assessment ensures high-level quality information is being transferred from the source point to the target point so that it is accessible to both current and future users. Once data complexity has been evaluated, business rules defined, information standards established, information governance structure detailed out, and data quality assessed; you are required to gather the migration requirements. Make sure to carefully analyze how, who, where will the data be put to use. In addition, you will also need to estimate the impact that the data will leave in the future. Risk management should be an integral part of the data migration process. Make sure that all data is accessible for any potential audits. In addition, ensure that all information systems comply with industrial, government, and companywide regulations. Change Management is another important part of data migration. Any change in the organizational setting requires careful consideration of the customers, vendors, partners, and everyone who will be participating in the new system. Change management ensures everyone involved in the system is kept on board. Getting all your teams on the same page will help you to a clear plan, thereby eliminating any sort of disconnect between the IT and business expectations. This is important since the IT needs to be aware of the strategic goals that a project migration needs to meet. Also, business leaders need to be aware and tactical of the operational challenges that are associated with a project. Getting all of them on the same page will help to align both the goals and the challenges thereby helping to create a better migration strategy. There are a few practices that organizations must follow to implement data migration successfully. However, one needs to consider choosing a vendor who will help to align with an organization’s vision and culture and provide a solution to address project requirements and unique infrastructure. In short, choose a vendor that will help you to follow the fundamental practices and help uncover business value, decrease organizational risk, and overall usability of data. 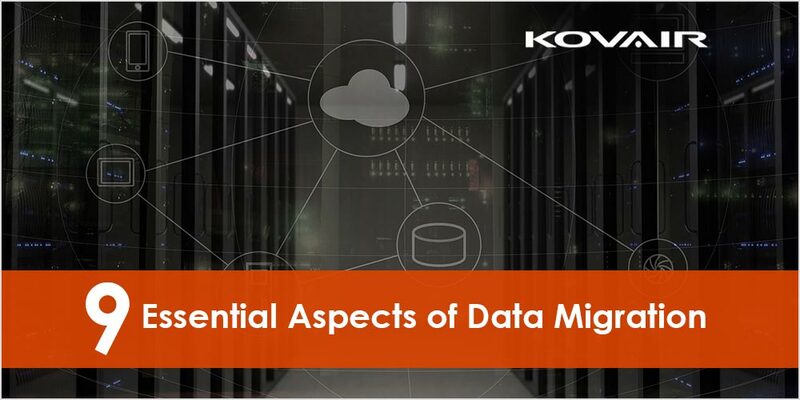 While most of the systems or software tools face the difficulty of data-to-data communication, Kovair Data Lake offers an SQL server database that is capable of transferring data irrespective of the type of tool they reside in. A new release is planned that will utilize MongoDB as well for additional flexibility. It is presumed that you are already acquainted with Kovair Omnibus enterprise service bus—the centralized platform that can implement an effective communication between diversified ALM tools. These tools, when integrated with Kovair Omnibus, allow the data to be pulled through the Omnibus data store using Omnibus extractors. In case if the data needs to be pulled from external tools then this can be done using data extractors, which are different from Omnibus extractors. Based on an organization’s requirement, the data can then be segregated according to department or business units by having multiple Data Lake instances. For more information, contact www.kovair.com today. Challenges in data migrationData LakeData MigrationData Migration ToolsData SynchronizationWhy data migration?